The second in the series by the Campbell's that will have you alternately laughing and groaning but having a great time reading about the misadventures of Cathy O'Farrell as she pieces together why a teenager would have a Glock pistol, why children's bicycles are being stolen by the dozens----and while she tries to figure out how to tell hubby that she really loves the community they live in and she does NOT want to move, despite all the bad stuff that seems to be happening in that community. Uh--I don't want to forget to mention that a couple of her best friends need some help as well!! It is written in idiomatic English (like in England)--but you will definitely get the idea of what the American slang would be in context with no problem. As usual I thoroughly enjoyed this book and am eagerly awaiting the next in the series!! 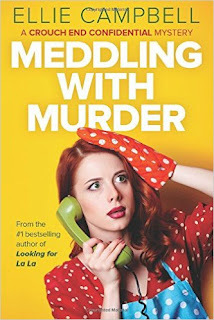 The first in this series "To Catch a Creeper" (read my review here)does not have to be read to thoroughly enjoy "Meddling with Murder" --but we always need some comic relief now--don't we? Ellie Campbell is a pseudonym for sisters, Pam Burks and Lorraine Campbell who collaborate across the mighty Atlantic, finding writing together the perfect excuse for endless phone conversations. They are equally passionate about travel, animals and the great outdoors. 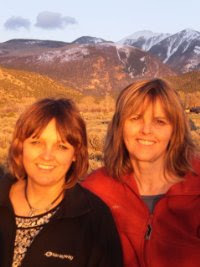 Although Pam lives near London, with husband, three children and a dog, while Lorraine is on a Colorado ranch near wild and wonderful Boulder with husband, five horses, five cats, one dog and four chickens - they both believe in enjoying life to the fullest, be it discovering new remote locations or going on trail rides in the beautiful Rocky Mountains. They love any chance to connect with their readers. How to Survive Your Sisters, published by Arrow, was quickly followed by When Good Friends Go Bad. Their third novel Looking for La La is now available. And Now-To Catch a Creeper! 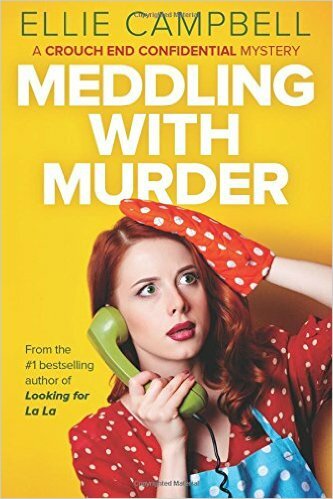 !--and Meddling With Murder!! I do love a good murder mystery! This sounds like a great read. Thanks for sharing this book review! I just got back into reading a little more fiction after sticking to mostly non-fiction for the last few years. This sounds like it would be a fun summer read or a great little weekend read too. I will add it to my list of things I want to read this year. Thanks! I always have a hard time reading books that use British slang. I never know what they mean sometimes! This sounds like a really good read. I am always looking for new books to read and mysteries are one of my favorites. I haven't heard of this series before, but I love a good murder mystery! This sounds like a book I would enjoy. This looks like an interesting book! I will have to look into it. I hate to be *that* person but I actually think this would make a really enjoyable show. :D It sounds like a funny and entertaining plot and the lead character even charming through her misadventures. I love books that contain slang or code switch. I think this makes the storyline more authentic. This book sounds like a good combination of humor and crime solving. A good read for summer. I absolutely love contemporary British writing! I hope this is as good.